Cheers to the Year! 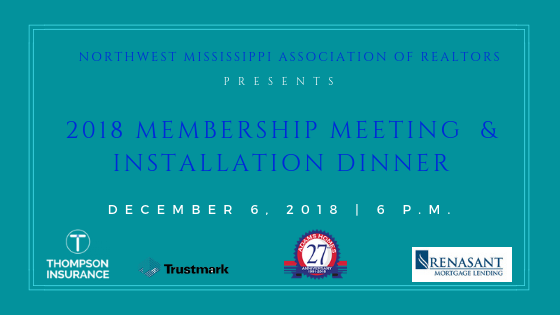 Join us for our final membership meeting and installation dinner as we celebrate the graduating 2018 NWMAR Leadership class, present the REALTORS Reaching Out Award sponsored by A+ Home Inspections and install our 2019 Board of Directors. We will have Jim Flanagan from the Desoto Economic Council as our guest speaker. Our sponsors are Thompson Insurance, Trustmark, Adams Homes and Renasant Mortgage Lending. Also, WE WILL HAVE SPECIAL GIVEAWAYS such as 2 tickets to see Carrie Underwood, a $100 gift card Mesquite Chop House and 2 tickets to the Memphis Tigers Basketball game. Each prize will have a separate winner.